I have been busy and enJoying working with folks on the healing table. Lets get you started, lets make this about you. I so love to assist others in healing. Make contact by sending me a email mauditau@gmail.com for your appt. "Spirit has touched my life in ways there are no words in the English language to explain. To be able to offer to you the same richness I have experienced is the reason, "I do what I do". Please enjoy this recent interview hosted by Lauren Galey on her show, "Quantum Conversations". We chatted about my life as a channel/healer and how I got started. In the show I also channeled Siria Family who guided the audience on a beautiful Higher Self meditation. "I have dedicated my life in collaboration with Spirit, together as Healing Allies and making art about those ideas". What pulls us out of suffering and into joy, love is what I am passionate about. I believe joy and happiness are the pillars we walk through, sustaining us in love. In this way, these mystical, yet grounding experiences are my muses, my guiding force". Art The Silent Healer™ was founded by Sheryl Ann Noday in Los Angeles, 1990 with a focus on spiritual communications thus making art from those narratives. The idea being to transport viewers into other worlds where mystical, metaphysical and healing ideas are opulent desiring to create a platform of wonder. Cultivating her gifts at a young age, Sheryl often say's, "She was Born to Channel", having her first channeling experience, giving voice to her Spirit Guides at 15 years old. Together in partnership we are dedicated to the magic of Art the Silent Healer. Testimonials~ "Sitting in the audience, when Siria Family first came through Sheryl I immediately noticed what I was feeling. As much as I wanted to hang on to old beliefs, I felt something melt then open up and soften. I admit I was initially shocked at how any resistance to believe quickly faded and I was transported to a different space- one of feeling unconditionally loved, held and perfectly safe. Siria family was so witty, so eloquent and had a way of weaving stories and concepts that really crystallized my understanding of why certain events were happening in my life. They were able to accurately elaborate on information that I didn’t mention about events at work that surprised me. I have been following those nuggets of insight and feel a new direction in my vocation beginning to bloom. It was the push I needed to begin moving out of my work rut and possibly the creation of a new job after being in the same one for fifteen years". "Thank you very much for your reading and artwork, very helpful". 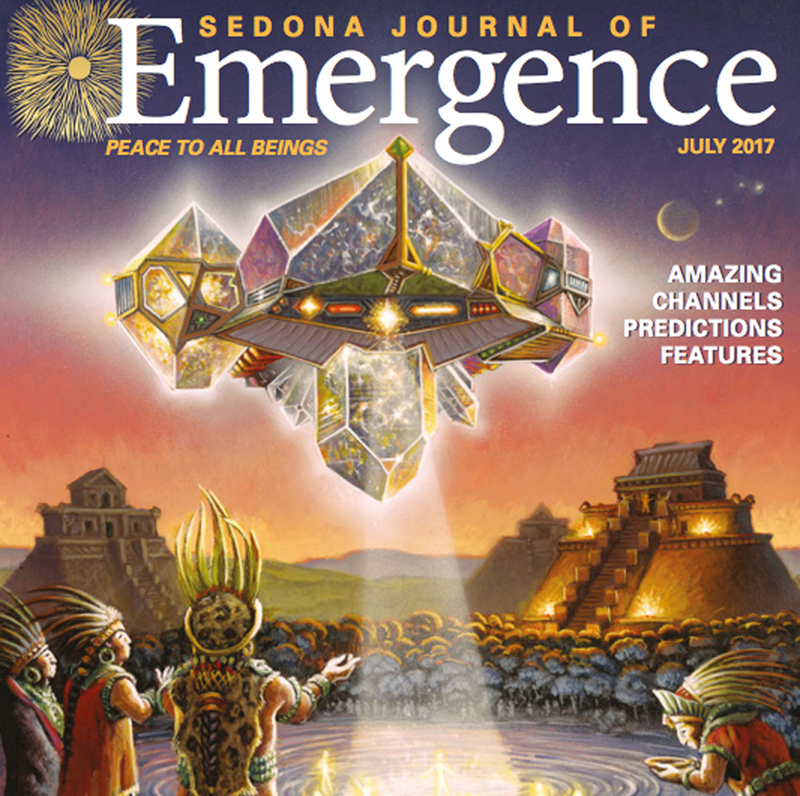 We are in this issue of Sedona Journal! Channeling Sessions with Siria Family are private consultations which are intimate, loving and and prove to be energetically shifting. I believe art heals. The healing in my experience comes from the blending of spirit and physical. Angels, Higher Self, Inner Child Self, Spirit Guides, Soul and Star Selves, even Future Selves are all part of our journey here on planet Earth.